Four 2018 BlueClaws are Phillies organizational All-Stars! 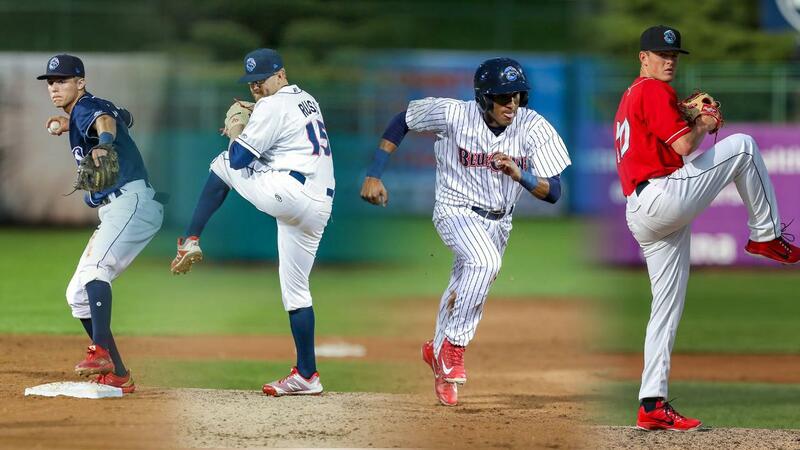 Several former BlueClaws were named to Minor League Baseball's Phillies Organization All-Stars, including four players that played for the BlueClaws in 2018: pitchers David Parkinson and Addison Russ, second baseman Daniel Brito, and shortstop Nick Maton. Starting Pitcher: David Parkinson went 8-1 with a 1.51 ERA with the BlueClaws over 17 starts before a late-season promotion to Clearwater. His final season ERA of 1.45 was tops among all qualified Minor League Baseball starting pitchers. He threw seven scoreless innings to lead the BlueClaws to a win in the Father's Day game that helped clinch a playoff spot. Relief Pitcher: Addison Russ went 5-2 with a 1.67 ERA and added 13 saves as a BlueClaw before a second-half promotion to Clearwater. He added 14 saves for the Threshers and had a 1.69 ERA in the Florida State League. Second Baseman: Daniel Brito hit .252 with four home runs and 15 stolen bases with the BlueClaws before an August promotion to Clearwater. He also was named a Rawlings Gold Glove Award winner as the best defensive second baseman in the minors. Shortstop: Nick Maton hit .251 with eight home runs and 51 RBIs for the BlueClaws this year. Maton also hit a game-tying home run as part of a three-home run, five-run ninth inning in a BlueClaws comeback win in Game One of the 2018 South Atlantic League Championship Series in Lexington. Read the full story from MiLB.com by clicking here.